Now to the children of the jungle comes the European emissary Hernán Cortes, representing the Piscean avatar, the “Prince of Peace” — an incarnation of Vishnu/divine love. 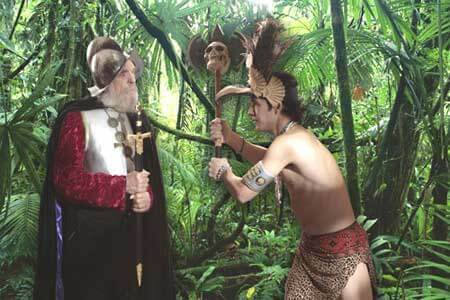 It happens to be 1519, and the Amerindians have been expecting the return of their bearded Quetzalcoatl — also an incarnation of Vishnu/Venus/Tlaloc. Everyone was right! Avatars don’t have to be — and aren’t usually — received and interpreted as their followers expect them to be. That’s part of what makes them magique…and somehow, magically, it all works out! —K’uhl Mut(i) Ahau. k AQUARIUS (1.19-2.17) Wham! Bam! Thank you, Ma’am! Jigsaw. She saw. Outta da can. We made it through da first terd. Das’ da werd. Only our insanity keeps us a root beer a-float. It’s perfectly clear. That’s all she wrote. It’s a Fool Moon weekend! Time to bring your strong end back in da sign of da kitty kat. What’s crazy is I actually get paid for dat! l PISCES (2.18-3.19) Jupiterians (favorite color is blue): You’re about to start anew, as the communication starts to come to — and then through — you. You awaken on Wednesday the 30th to place your vote on the worthiest of the 2 that you’ll note. It’ll finally be up to you. Neptunians (favorite color is purple): Not yet, my pet. Meow. a ARIES (3.20-4.18) You’re the leader of the pack. Don’t look back. You’re ahead — or you’re dead. Mars is finishing in Aquarius while Aquarius’s ruler (Uranus) is starting in (at 5°) Aries. You’re going to have a way out weekend — you and your/an Aquarian/unusual friend. b TAURUS (4.19-5.19) One more week to think. You’re both playing the victim. How’s your public gonna choose who’s gonna win or lose? It’s up to youse — and how you gonna play it? In another week, when next we speak, then it’ll be time for you to say it. Let’s face it; in America, whoever looks the prettiest and most confident wins. c GEMINI (5.20-6.19) You’ve got a brilliant idea starting/sparkling! It’s like a light bulb just went off in your head, and you can’t turn it off and/to go back to bed. It’s like somebody/something turned on the switch to scratch the (9th House of education/travel) psychic itch in your head. With Mercury conjunct the Sun in Aquarius, your computer offers an answer and lotion/solution. d CANCER (6.20-7.21) Uh, oh! Fool Moon in your 2nd House in opposition to a Mercury/Sun conjunction in your 8th House. Here comes some unexpected money! Time for you to act craaazy and get paid for it! Let the kitty kat (You[’ll] know who I mean by that) arch their — and scratch your — back. Meeeeeooowwww…and stay warm. f VIRGO (8.22-9.21) Children have something to teach. You, as the humblest of signs, should/will know that. Children are a gift from/through the life force, the hope for our future, and a reason to continue living and learning. We need them as much as they need us. Everything else lives and dies. Only the family survives. i SAGITTARIUS (11.21-12.20) Time to start. Who’s your partner? Who’s your partner gonna be? Which one? Or, which two? Work backwards. Who’s treated you the worst during these last few months, while your ruler Jupiter was retrograde in your opposite sign? Time to choose accordingly. Get all the paperwork done and corrected, and all the communiqué outta da way by your next half-birthday; I’ll say by the Full Moon in June.